Here are some BlueEyes hardware tricks. To make the Bluetooth communication reliable we developed our own serial-port-micro-stack. Unfortunately - Windows 2000 and its ACPI extensions very much fiddle with mobile computers' communication ports. 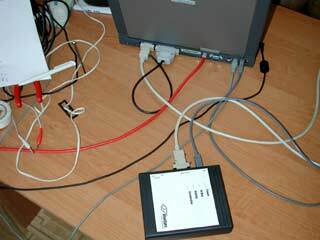 On our Toshiba laptop - the system maintained an illegal state of the closed COM port lines (all voltages at 0V). After opening the port - the voltages were coming back to their normal values, which easily stupified the Bluetooth module. 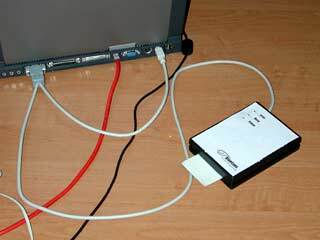 It is possible to turn off the ACPI extensions, but this in turn, results in losing control over system hibernation - after couple minutes of inactivity the laptop hardware was putting the computer in a power saving mode, which efficiently shattered the wireless communication. ...have an autofire-enabled mouse ! The main idea is extremely simple - a standard 555 timer IC every 10 seconds crosses the middle-button microswitch, which is fully equal to a "manual" click. 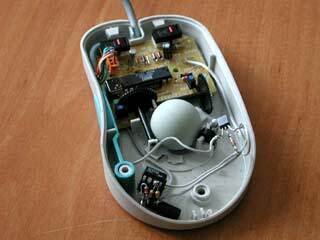 With such a mouse our Toshiba would never hibernate. Here are our multi-standard cables. To be able to reset properly the Bluetooth module contained in the CSU Interface box, we have decided to make a serial-parallel combo cable. The serial part provides an RS232 communication channel while the parallel part is used to reset the module and to drive the status LEDs. Another cable is the USB one for powering the device. And of course two more cables for audio input and output, which are missing in the picture. For the curious - we could not use the remaining COM port lines (such as DTR) to reset the Bluetooth module. As we wanted to run our transmission at 115200 bps and the Bluetoth's default (after reset) is 57600, we had to change the baudrate after resetting the module. Unfortunately, when changing the baudrate, the remaining lines generate a short pulse which would reset the Bluetooth module (setting the speed back to 57600 bps). 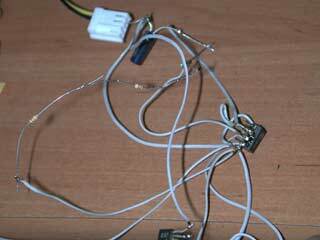 The ID card programmer is driven by the serial port. 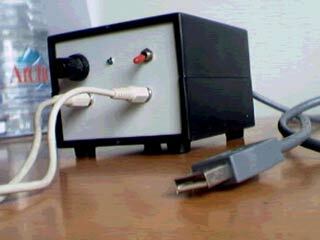 So what is the PS/2 plug for ? As you may guess - it is the power source. Because the CSU interface occupies one COM port and the laptop doesn't have more - the programmer is attached to another laptop and is accessible by means of a simple TCP/IP network protocol. Here is a full BlueEyes interconnection diagram.